by Rob - September 22nd, 2012. 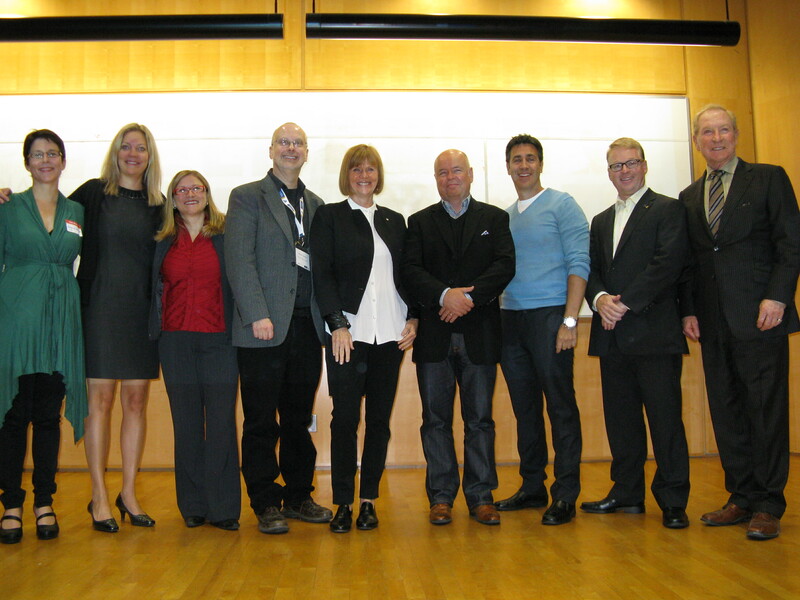 On Saturday, September 22, 2012, the RTA School of Media Wall of Fame was unveiled at my alma mater, Ryerson University in Toronto; I am thrilled to be one of the initial twelve inductees. 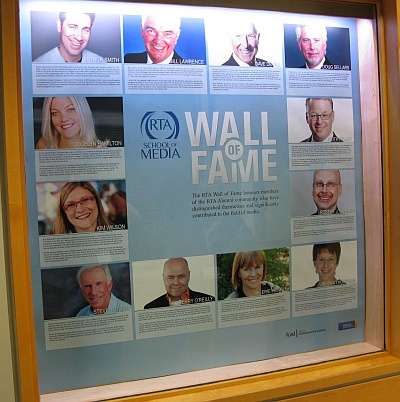 The Wall of Fame is sponsored by the RTA School of Media (formerly the School of Radio and Television Arts, the top-rated broadcasting school in Canada, established 1953) and the RTA Alumni Association. Jocelyn Hamilton, Vice President, Original Programming, Kids, Comedy, Drama, at Corus Entertainment. Keith Pelley, President, Rogers Media Inc.
Robert J. Sawyer (class of 1982) is one of only eight writers in history — and the only Canadian — to win all three of the world’s top awards for best science-fiction novel of the year: the Hugo (which he won for Hominids), the Nebula (for The Terminal Experiment), and the John W. Campbell Memorial Award (for Mindscan). According to the U.S. trade journal Locus, he has won more awards for his novels than anyone else in the history of the science-fiction and fantasy fields. Ten years prior, in September 2002, I received Ryerson’s Alumni Award of Distinction; I am one of only eighty people so honoured in Ryerson’s history. Of the initial twelve RTA Wall of Fame inductees, only Dave Devall, Valerie Pringle, and myself are also Alumni Award of Distinction recipients. I very much enjoyed my time as a student at Ryerson — graduating 30 years ago, in 1982, with a Bachelor of Applied Arts degree in Radio and Television Arts. 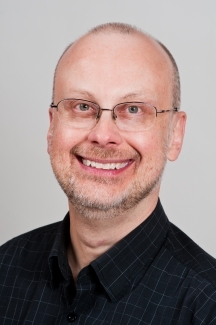 I also spent a year on staff in the School of Radio and Television Arts (the 1982-83 academic year), and returned to Ryerson in the 1996-1997 and 1997-1998 academic years to teach continuing-education courses in science-fiction writing. In 2008, for Ryerson’s sixtieth anniversary, I was commissioned by the university to write this piece about the university’s future. Congrats. In light of the other awards you’ve won, I’d think it might pale a little, but then, I’m not sure I’d ever tire of awards.